Fans of the Taiwanese King of Pop, Jay Chou, hold on to your seats because the very sandwiches endorsed by him will be made available to Singapore at VivoCity, Basement 2-k22. 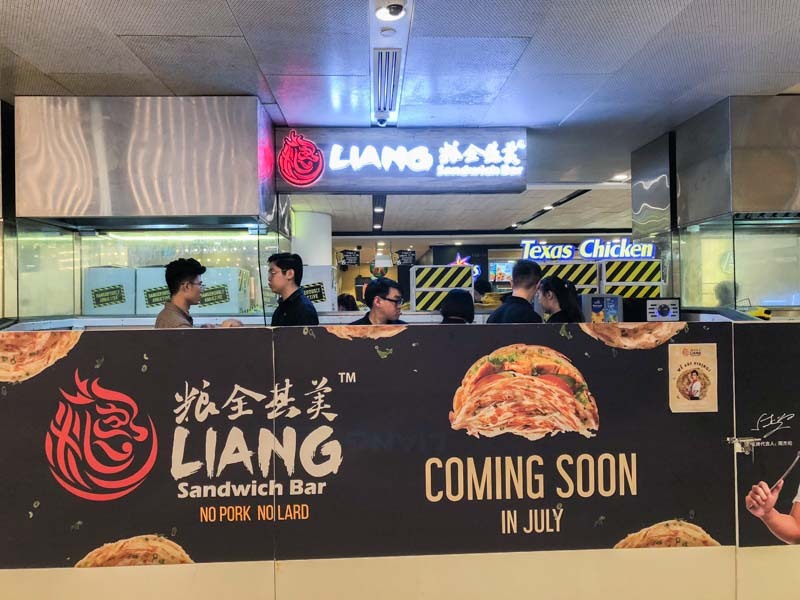 Liang Sandwich Bar will also be handing out free sandwiches to their first 100 customers over their opening weekend, 7 & 8 July 2018, so brace yourself for the wait if you’re feeling up to it. The pancake-like sandwiches are flipped freshly over a sizzling hot pan. It takes awhile for the pancakes to turn golden-brown, perhaps that’s why we waited so long just to get our first one. Anyhow, let’s just hope that their other customers won’t have to while their time away waiting for their food like we did. For the sweet-toothed, I’m sorry to say that they only offer savoury sandwiches for now, but they just might decide to bring in their sweet counterparts in future. We started with the Scallions Sandwich ($2.50) which I saw as the ‘building block’ of it all. It’s basically a plain sandwich but I was surprised that it was actually pretty fragrant. We could really taste the scallion oil, but not enough to make us forget that we didn’t have any other ingredients along with it. Nonetheless, it’s a great affordable snack if you’re just feelin’ peckish. Following that, we had a go at the Chicken Patty Sandwich ($5.50) which comprised two halves of a tiny chicken patty. The patty was seared just enough to give us that charred flavour, but topping up $3 just for the chicken and meagre vegetables was a little bit of a turn-off. The Tuna Mayo Sandwich ($4.90) didn’t offer us much to rave about, and the little serving of tuna mayo was making it really difficult for us to like it too. Plus, the mildly sour aftertaste of the tuna made a rather strange combination with the egg coating. Ah, the signature Liang Chicken Sandwich ($5.90) that we *finally* managed to get our hands on after the long wait. Termed as “Jay Chou’s favourite”, the sandwich offered us chicken breast chunks and the same sparse portion of veggies. We recommend that you go for the cheese sauce, as we did. The JC Soya Drink ($2.90)‘s name is pretty much self-explanatory, as seen from the Jay Chou printout on their cups. Their sandwiches may not have impressed us much, but the soya bean drink was legit. Whichever machine they used to achieve the foamy, milky beverage, it’s working. I guess me having two cups on my own is a testimony to how good I thought it was. Overall, I felt that the concept of having light, flaky sandwiches was really refreshing, and some of them were actually pretty yummy. But the long wait before even getting to try them got us feeling impatient, and I really hope that they up their sandwich-making game so you guys don’t have to go through the same delay as we did.